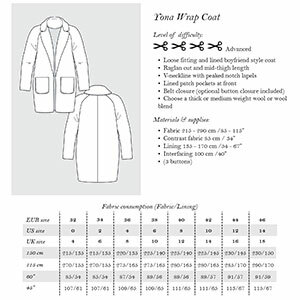 The Yona is a loose fitting and lined boyfriend style coat with a V-neckline and peaked notch lapels. It features a raglan cut, mid-thigh length, lined patch pockets in the front and a belt closure (optional button closure included). Suggested fabrics are mid to heavy weight wovens such as wool or wool blends or you can also use a stable knit such a Ponte de Roma or sweatshirt knit.